TiGr Mini Review: The best ultra-lightweight U-lock alternative? I get a ton of questions about bike locks. My answer is usually uniform: don’t bother with cables, don’t skimp on the cheap stuff, go for a big, heavy, hardened steel lock. That’s because steel is usually the best option. There just hasn’t been a ton of innovation, particularly with regards to weight. I totally understand too, it’s a tough nut to crack. 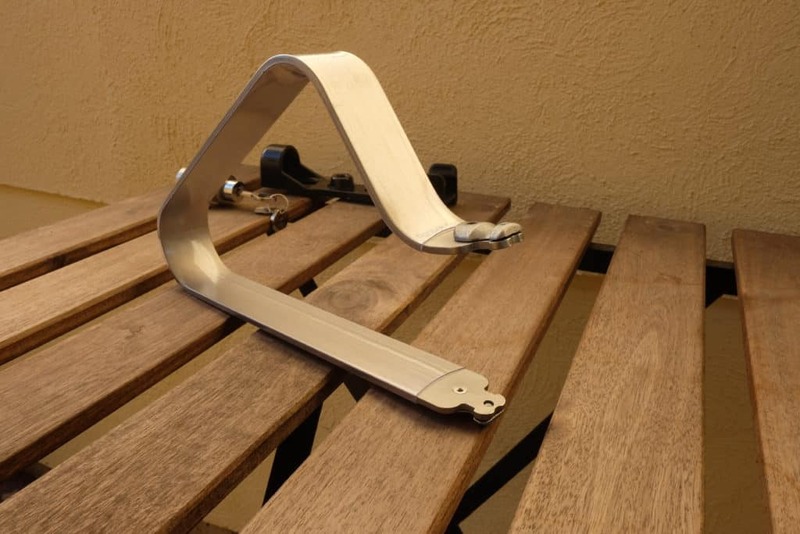 How on earth can you keep your bicycle safe and secure with featherweight lock? Typically a light bicycle lock means compromised durability. But what if you move away from steel entirely, to an exotic material like titanium? The TiGR Mini has done exactly that. It’s a tiny, attractive little U-lock alternative and I’m crazy about it. It’s a popular lock with a premium price tag, sold on TiGr Lock’s website and also found in various shops and retailers around the web. So how does the Mini stack up to the competition? Is it worth the sticker price? Will it keep your bicycle as secure as those heavy, brand name lumps of steel? TiGr Lock kindly sent me a review unit to check out and after a few weeks of use I’m ready to share my thoughts. 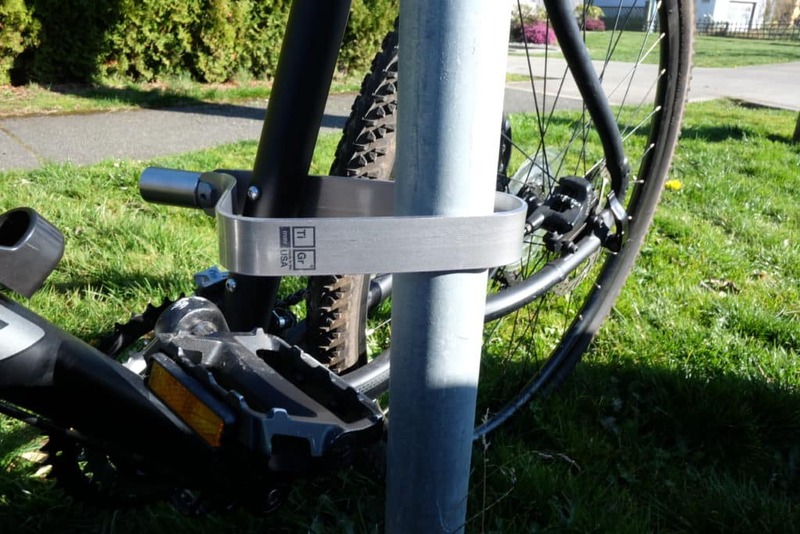 Is the TiGr Mini an indestructible, unbreakable bike lock? Nope. But that’s only because such a thing doesn’t exist. Sadly, there is no lock on earth that’s impervious to a professional bike thief. A portable angle grinder can cut through absolutely everything. Proper bicycle security is less about finding an uncuttable lock and more about making a theft annoying and obtrusive and very labour intensive. You want them to move on to easier pickings. The real question then is: does the TiGr offer a suitable deterrent? Does it offer the top-of-the-line protection against the possibility of bike theft? I’ll answer that as we go forward. Let’s take a look at it. I absolutely love how this bike lock looks and feels. When I received the review unit from TiGr I was really surprised by the weight. I mean, I was expecting it to be light, but I quite literally said, “Wow!” when I picked it up. It is 0.9 pounds, and a lot of that is in the steel lock cylinder. My “daily driver” is a hardened steel chain that weighs about 6 pounds, so using this lock on a daily basis was revelatory. Whether in a backpack or attached using the included mounting bracket, I could feel the difference. Titanium has half the weight of steel, which means you only need half the material to match steel’s strength. It’s also far more ductile and less brittle, meaning that under extreme force and pressure it will “squish” and bend rather than snap or shatter. TiGr has chosen a wide, flat shackle design. I suspect this is to make the most of such an expensive metal but there are also security benefits which I’ll get into shortly. Viewed from the side, the lock is almost invisible. It has a premium appearance, though a little atypical at first. I’ve had a few people ask what the heck it is. I believe that function is as important as security. There’s no point building a great lock if it’s too frustrating to use. One of the things that makes the TiGr Mini one of my favourite low weight bike locks is the pure usability. As a big “User Experience” guy, I’m smitten by this little lock. TiGr has put a ton of careful thought into everything ranging from ease-of-use to tactile satisfaction. The lock is coated with a translucent PVC coating. Smart, because without that I expect it’d do a number on your paint job. Attaching the lock is simplicity itself. Stretch open the lock with your hands and place it around your bike and the anchoring object. Squeeze the rivet ends together, and put the cylinder onto the rivet ends. Push on the end of the cylinder and it pops into place. Stretch it open with your hands? How can you trust a lock that’s so bendy? As mentioned before, titanium is super ductile and twice as strong as steel. A thin steel lock would not be a great idea, but a thin titanium bicycle lock like this is still very cut and pry resistant. And this offers a huge functional advantage over other locks. That ability to stretch the lock wider is massive! 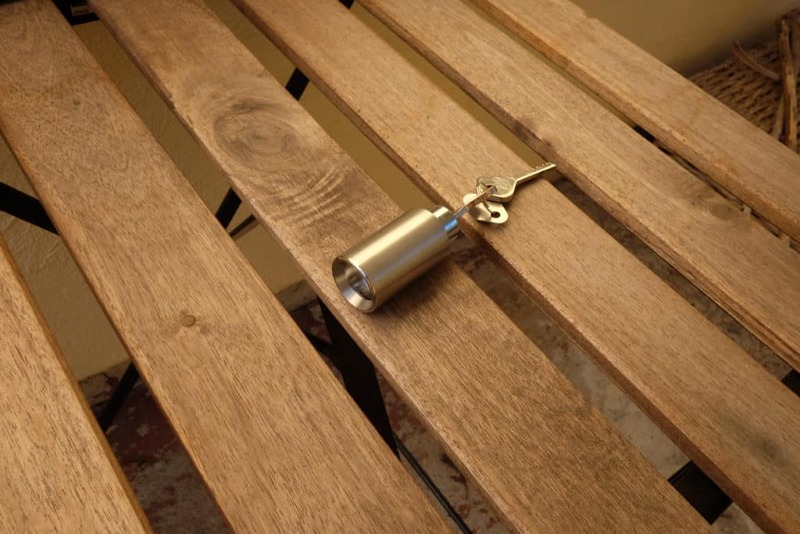 It allows you to fit the lock quickly, and lock up to very tight spots. There’s an added security benefit there: the less space you leave, the harder it is for a thief to cut. The lock has a PVC-style coating that prevents frame scratches. The TiGr Mini can be stretched open to fit around wider objects. The disc detainer-style lock is really quite easy to attach. Security: is the TiGr Mini one of the strongest lightweight bike locks around? Short answer, yes. I believe that the Mini is as good as many hardened steel U-locks in several respects, with a couple of advantages. Here’s my take on how the TiGr Mini would withstand a few of the common methods used to compromise bike locks. Lock Picking: When people think of vulnerabilities, a lot of folks immediately go to lock picking. It isn’t really that common though, as brute force tends to be quicker and more consistent. A skilled individual with the proper tools could conceivably pick the TiGr’s disc detainer style lock; there are several Youtube videos showing this. However, like I say, unless there’s a widely published vulnerability (like the Bic pen fiasco) you shouldn’t lose sleep about this. Hacksaws: Hacksaws work, but it’s a lot of work. 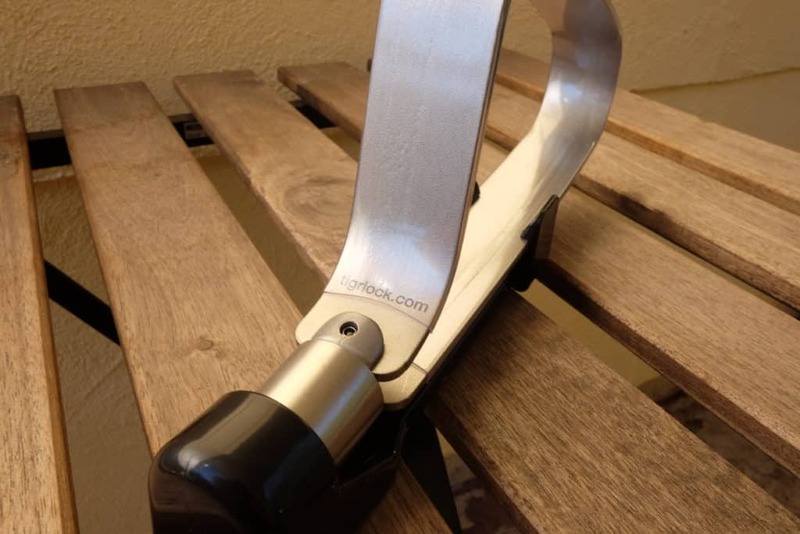 A carbide steel hacksaw blade will cut through the hardened steel shackle of a high-end U-lock, but it will take you ages. Similarly, you can cut through a TiGr Mini, but it’s just as labour intensive.Hacksaw attacks aren’t very common, honestly. If you’ve locked up correctly leaving very little room to work, then good luck getting a hacksaw blade into place. Still, it’s nice to know that IF your bike faced such an attack, it won’t be quick or easy for the thief. Bottle Jack: While brute force is probably more effective against a slimmer, lighter lock like this, I expect the TiGr Mini would be highly resistant to a bottle jack attack. That’s because it’s so small it’d be all but impossible to get the jack in place. The irregular shape and construction of the TiGr is an ally. Pry Bar: The Mini has proven capable against pry bar attacks due to its flexibility. The thin nature of the titanium shackle and its willingness to bend without breakage will stymie most efforts.That said, given enough leverage and force almost anything can be broken. I’ve seen video evidence to feel comfortable that the TiGr can stand up to such efforts, but as always you’ll want to be careful not to leave excess free space inside the shackle. Bolt Cutters: This is an important test because bolt cutters are a favoured tactic of thieves.The TiGr shows above average resilience to this means of attack. The ductile quality of titanium means that cutting can be an exercise in frustration. When force is applied via the blades on a set of bolt cutters, it tends to squish rather than snap. Additionally, the slim profile of the Mini means the cutters have a lot less leverage than against other locks. They will often hit their stops before compromising the shackle. I’ve seen some older videos of TiGr locks being compromised by bolt cutters, but those appear to have been the old 0.75″ width designs. The current 1.25″ models meet or exceed bicycle security standards, and they’ve proven far more resilient to cutters. By contrast, a cable lock stands virtually no chance against cutters. Angle Grinders: Like all others, the TiGr Mini won’t withstand a portable angle grinder with a carbide cutting wheel. Nothing really does. But TiGr’s testing shows that it takes roughly the same amount of time as a hardened steel shackle to cut.That said, the stretchable, flexible quality of the TiGr lock and its small size could make it awfully difficult to get the grinder into position. Always lock up with as little free space as possible. There’s another advantage: Titanium throws a ton of sparks when cutting this way. Any attempt on your ride with a grinder will be super visible. Beyond traditional methods of attack, the Mini has another big advantage: it’s unique. Bike thieves prey on the familiar: cable locks, U-locks, chains. That’s what they’re used to. But when you throw something different at them, they might be left scratching their heads. The TiGr Mini is a different approach, and one that a thief might not have an answer for. I would lock up using a similar strategy to a U-lock. 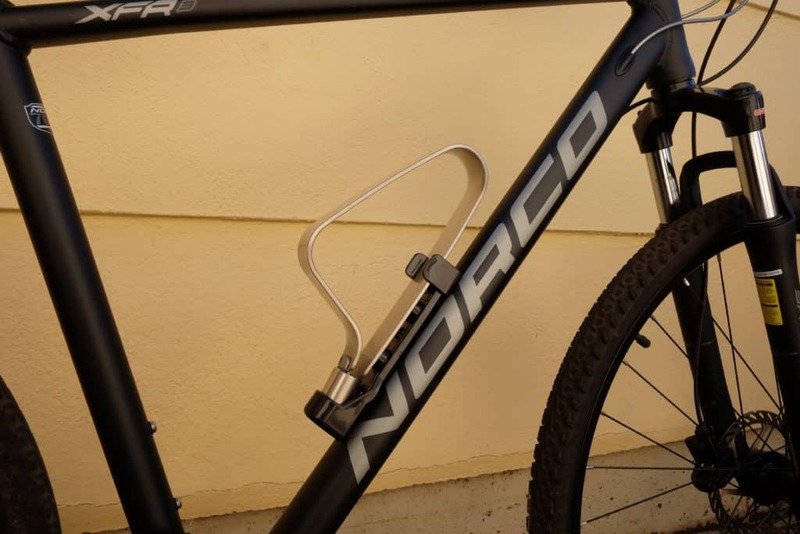 Make sure that the lock fits around a secure spot on your bike’s frame (preferably inside one of the triangles) and then around a fixed object, like a signpost or bike stand. If possible, fit the lock around both the seat tube and the rear wheel. This eliminates extra space and keeps both parts of your bicycle nice and secure. I found that the TiGr Mini was a little bit too small to fit around both the wheel and frame of my Dual Sport, but it should easily fit around the frame and rear wheel of most road bikes. If you ride something with thicker tires and wider rims, you might prefer the Mini+, which offers more space inside the shackle. Here’s an example of a quick signpost lockup. It took just 5 seconds to secure. Ideally, you’d want to leave less space than I have here. The stretchable quality is very helpful; if you can manage to get it around both the seat tube and the rear tire, do so. A quick TiGr Mini lockup to a signpost. 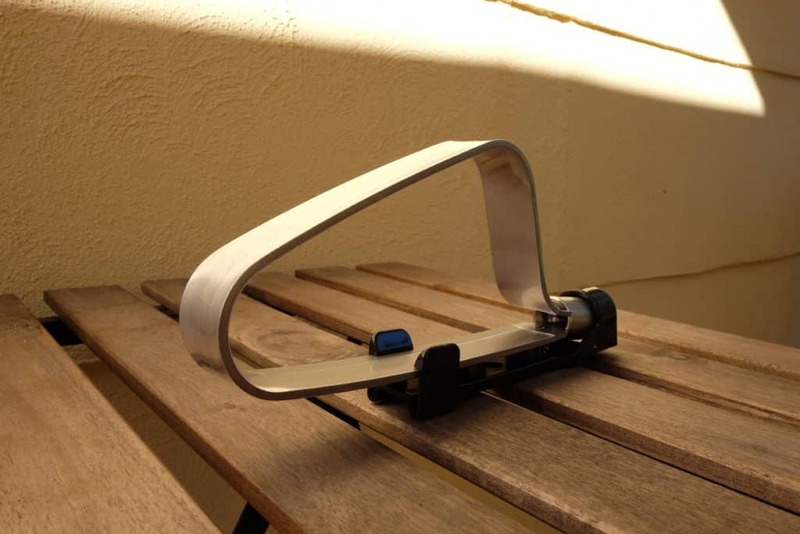 TiGr Mini: top lightweight bike lock available today? It’s certainly amongst the top contenders. There’s a lot to love about this handy little lock, from its stunning design and ease of use to its security features and remarkably low weight. There are few featherlight locks I’d trust as much as this one. For that reason I think it’s absolutely worth the $99 price tag. OK, but is the TiGr Mini as strong as a hardened steel chain or U-lock like, say, a Kryptonite? As much as I like the TiGr, in a head-to-head match-up I’d still put my money on the heavy duty hardened steel clunkers. I definitely see a strong niche for the TiGr as an auxiliary lock to attach wheel to frame. It’s so light you won’t really notice the extra weight, and it’s far, far superior to any secondary cable lock I’ve run across. A heavy steel shackle to secure the frame and front wheel and a TiGr to lock rear wheel to frame would be a fantastic lock strategy. For these reasons I strongly recommend the TiGr; it has achieved pride of place on my list of the strongest bicycle locks. Price: $99 USD on TiGr’s website. Pros: Incredibly low weight, stretchable to fit around objects, low profile, durable against many attacks. Cons: Small, limited space to work, some vulnerabilities. I love the look of the lock, very cool. Thanks for sharing.